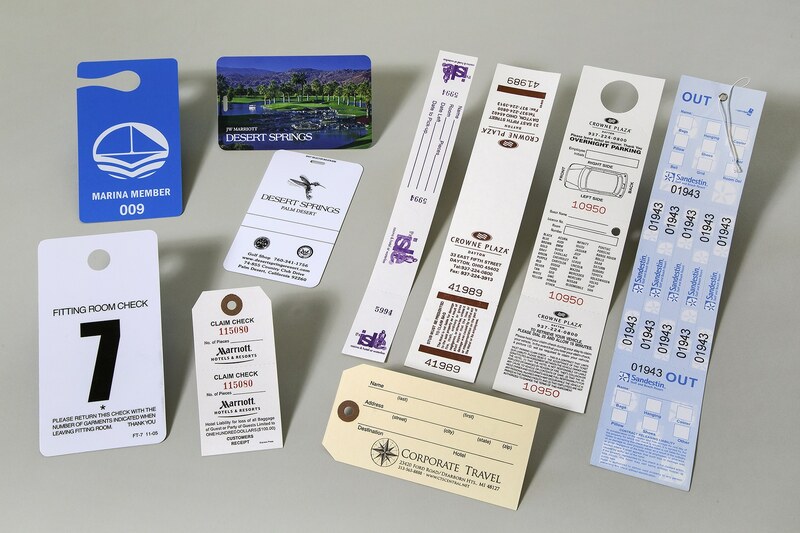 Supply your hotel with custom luggage tags, name badges and parking permits. We design and print tags and permits to make your guests stay memorable and hotel profitable. Contact one of our helpful representatives to discuss your hotel supply needs. Request a tag or permit quote by calling 888-859-2061 or filling out the form below. Custom tags from Front Desk Supply will transform the way you operate. Our ability to produce hotel luggage tags and valet tags will streamline operations and keep customers happy. Choose from a variety of shapes, sizes, colors and materials. Ask us about hotel key cards that convert into luggage tags. These provide a fun and practical way to remember your hotel! Finally an easy way to tag and manage hotel guest luggage. Luggage tags designed to help manage hotel luggage. Branded tags that valet can give to the hotel guest. Tear off, windshield and ticket style are among the most popular tags and parking permits. Hotel employees need to be easily identified. That is why name badges are a standard for those who work within the hospitality industry. There are many style choices! Let us help you design the most cost-effective name badge for your hotel. Call Front Desk Supply 888-859-2061 to order name badges or luggage tags for your hotel today! Every guest sees hotel tags and badges multiple times during their stay. Front Desk Supply focuses on making quality products with a memorable design. Guests won’t forget where they stayed! Because we have graphic artists on staff and printing in house, we are able to produce luggage tags and name badges quickly and on budget. For custom quotes, sample or catalogue requests, simply fill out the contact form or call 888-859-2061 and we’ll get right back to you!